Welded lathe bed of thick-wall profiled steel, more solid and stable. Reasonable lathe table design, 10mm thickness steel plates fixed on lathe table covered by cast sheath with spikes. Steel plates will not be damaged even under raging flame. The level difference of whole double-deck plates will not be damaged even under raging flame. Advanced material inclined discharging design. All finished work pieces and fragments slide into both sides of tunnel for safe and convenient collection. Panasonic Servo motor, Taiwan servo speed reducing device and high accuracy rack transmission. Lower noise, stable and accurate coordinate movement. Start control system made in Sino-US joint venture and Germany design Software FASTCAM with auto material saving function. American Cut-Master power supply (Power: 40A/120A/200) together with high sensitive arc pressure adjuster, Self-adjusting to choose the best distance between plasma head and work piece automatically in order to ensure cutting accuracy. 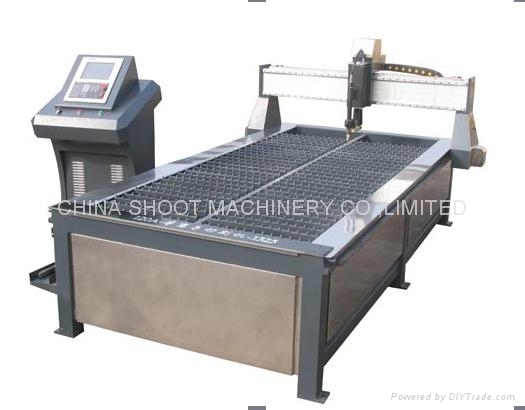 Best choice for all kinds of different thickness material and heterotypic sheet cutting.